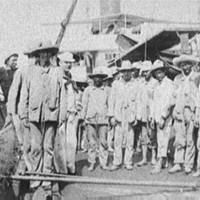 In 1898, an independence movement in Cuba led to conflict between Cubans and their Spanish rulers. The U.S. demanded that Spain withdraw from Cuba and allow the islanders to rule themselves, but Spain refused and declared war on the U.S. This war would result in the end of Spanish colonial rule in the Western Hemisphere.